I grew up on Prince Edward Island. As a youth I heard stories of the once-booming silver fox industry, which brought considerable wealth to the province in the early 1900s. 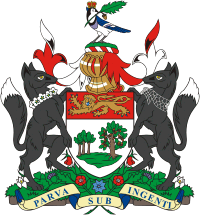 While fox ranching has long since ceased, one need look no further than the provincial armorial bearings, adopted in 2002, for a reminder of its former significance. 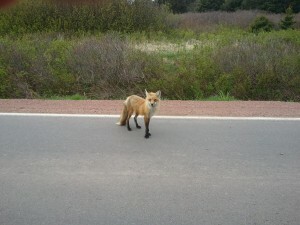 Red foxes are native to the woods and fields of Prince Edward Island. 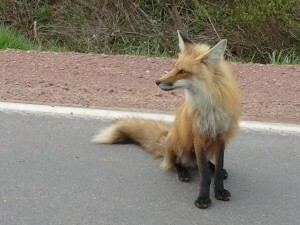 (The silver fox is a rare mutation of the red fox.) Despite spending countless hours exploring the Island’s outdoors as a youth, I only spotted a fox once before moving out of the province to attend graduate school. I still recall that moment. I was in grade ten, and was taking my dog for a walk. We were cutting through a nearby wheat field when I spotted the fox leaping through the rows. It was majestic. Over the next few days I mentioned my sighting to a number of friends and family members and, for the most part, they shared stories of the rare time they too spotted foxes. Much has changed in the past fifteen years. 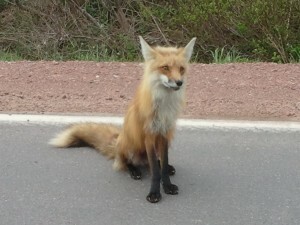 Fox sightings are now commonplace, even within Charlottetown. Whereas foxes once avoided human contact, they now venture up to parked cars, presumably looking for food. Likewise, their kit can be found playing alongside popular city walking paths during the early summer. The increased visibility of the province’s fox population is startling, particularly given its rapid occurrence. At the root of the problem is the recent introduction of the eastern coyote. It is believed that coyotes first entered the province in the late 1970s, having crossed the Northumberland Strait during the winter. While the two animals enjoy the same habitat and enjoy many of the same food sources, the much larger coyotes, which typically weight 30 pounds but have occasionally grown larger than 50 pounds, have driven the foxes into the human sphere. What happens next? Some Islanders fear that coyotes may pose a threat to their children and pets, and therefore want to see the coyotes culled. Biologists have argued that placing a bounty on the animals will not be effective, and that Island residents will have to get used to life with coyotes. By extension, Islanders will have to get used to the new position of foxes. This past December I was visiting my family on Prince Edward Island. One day, as I drove between the communities of Bonshaw and Cornwall, my car hit a fox that was running across the highway. I felt awful. Furthermore, the strike caused significant damage to my car’s bumper, so the next day I took it to an autobody shop. As I explained what happened one of the employees laughed and said “I wish you’d hit a few more of them. Those foxes are all over the place!” Looking back at this statement I can’t help but wonder if we’re seeing a shift in the public conception of foxes. Are these beautiful creatures on their way to becoming considered public nuisances? Ryan O’Connor is a SSHRC Postdoctoral Fellow at Trent University. A historian of Canada’s environmental movement, he maintains a research blog at www.thegreatgreennorth.com. I think what you’ve illustrated so beautifully is that human beings have a very inconsistent relationship with animals. We have yet to find a place in our society for wild animals and that, in my opinion, is a great shame. I think a perfect example of this is the attitude towards wolves (which is quite evident with the Harper Government’s call for poisoning wolves in the boreal to “save” woodland caribou). Wolves are frequently hunted to near extinction in places and then there is a call to revive their populations, especially since they are needed to keep deer and elk populations lower which, in turn, helps protect forests and grasslands from the risks of catastrophic fire. Then once wolves start to recover a new call comes out to cull them again because people are increasingly uncomfortable with their numbers. It is very saddening to watch this cycle. Tim Flannery pointed out in The Eternal Frontier that for tens of thousands of years North America has been without large mammal predators and slowly this has been damaging the ecology of the continent. He noted that if we want true environmental health we will have to look carefully and closely at the role large mammals play in all of our lives. I think your piece is a poignant reminder of this. We live in the area of UPEI and Sport PEI, the old PVI Building in Charlottetown. We see foxes every day, sometimes three times a day in our yard and going up and down the street. Lately a silver fox is now in our backyards and he is very pretty and looks almost like a dog. Although people are not supposed to feed them, many take pity on them and offer them food. The ones in our yard know our family and respond to our voices. They also love to steal soft rubber things like clogs and one night when I left our hose outside they chewed holes in it, must have thought it was a big snake. They are magnificent animals and it is so funny when all the crows start cawing and warning all their family members that “the fox is on the run.” I hear the crows and shortly after sure enough along comes Mr. Fox. Some people say that they steal and eat cats but the one in our yard plays with one of the cats so go figure!!! !